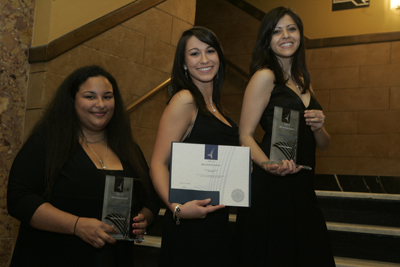 HEC Montréal celebrated its students’ varied and impressive achievements at the first Recognition Awards gala, held at the Théâtre Outremont on March 31. 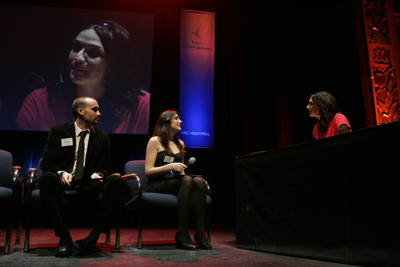 The interview-variety show formula was an excellent way to present the 25 activities and projects selected by the jury to the some 200 guests at the evening ceremony. These projects and activities, by 131 undergraduate, graduate and postgraduate students, were ranked in eight categories: citizenship; networking; social; communication; contribution to HEC Montréal’s reputation; knowledge development; innovation, succession and development; and arts and culture. The School presented the undergraduate Student Life Personality award to BBA student Sarah Panchbhaya, and the graduate and post-graduate Student Life Personality award to MSc in Administration student Myriam Brouard. The jury also gave an honourable mention to BBA student Fiona Lepage, for her commitment on the HRM committee, which organized the 2008 Symposium on Human Resources Management, a competition among several Quebec universities. Lyne Héroux, Director, Student Services, said she was impressed by the students’ creativity and energy, and thanked the jury members for their work. The jury consisted of Jacques Nantel, Pierre Francq, Director of the Career Management Service, Mélanie Gagnon, Development Advisor (Scholarships), Development Office, Diane Lauzon, Student Life Co-ordinator, Student Services, Michel Lemay, Director of Alumni Services, and Jean-Sébastien Marcoux, Associate Professor with the Department of Marketing.